The palace of Dwaraka ever twinkled with the presence of Krishna’s many wives. Rukmini, Sathyabama, Jambhavathi and all the others went about their usual chores serving Krishna and all the others of the extended Yadava clan. With the blessings of the goddess of wealth, the treasuries of Dwaraka always overflowed with jewels and precious stones. Sathyabama was the beautiful daughter of Satrajith, the owner of the sacred Syamantaka jewel. She was haughty and proud of her royal lineage and good looks. She prided herself on her pure love for Krishna and yet she was jealous of Rukmini, the goddess of wealth incarnate. Rukmini on the other hand, being the first queen of Dwaraka was a very humble lady and a pious wife. She let nothing come in the way of her devotion to Krishna and served him with whole hearted love and devotion. One day, the divine sage Narada, the creator of mischief, came to Dwaraka to offer his salutations to Sri Krishna. In the courtyard he met Satyabhama, beautifying herself with some flowers on her tresses. He walked up to her and with a voice of absolute innocence asked her, “Rani Satyabhama, dont doubt my intentions, but is it my old age or is it really true that Krishna loves Rukmini more than you?” Sathyabhama was thoroughly shaken and stood still, gaping at Narada.”You are far more beautiful and charming than her. You are the younger queen. Dont you think you deserve more attention?”, prodded Narada again. Pulling herself together, Satyabhama looked inquisitively at Narada, “Tell me divine sage, what should I do to gain his undivided attention? You are my only hope now”, she pleaded to him. Rishi Narada arrived in Dwarka and in the course of conversation hinted to Satyabhama that the love that Krishna exhibits towards her is not all that real and in fact it is Rukmini(the first wife of Krishna) who has real control over his heart. Unable to bear this, Satyabhama challenged Narada to prove it. Narada, with his way with words, tricked her into accepting a Vrata (ritual) where she has to give Krishna away in charity to Narada and reclaim him by giving the weight of Krishna in wealth. Narada lured her into accepting this vrata by telling her that Krishna’s love to her will increase many folds if she succeeds in performing this Tulabharam. He also instigated her ego by hinting that her wealth may not be sufficient to equal the weight of Krishna. With Satyabhama's ego duly raised, she told Narada that she can mobilize so much wealth that it is a child’s play for her to outweigh Krishna. Narada warned her that if she is not able to do this, Krishna will become his slave to be done with as he pleases. The scene was soon set for the vrata. Satyabhama gave Krishna away in charity (dana) in spite of the other wives’ pleadings. Krishna, always the mischievous cowherd, meekly submitted to this drama. 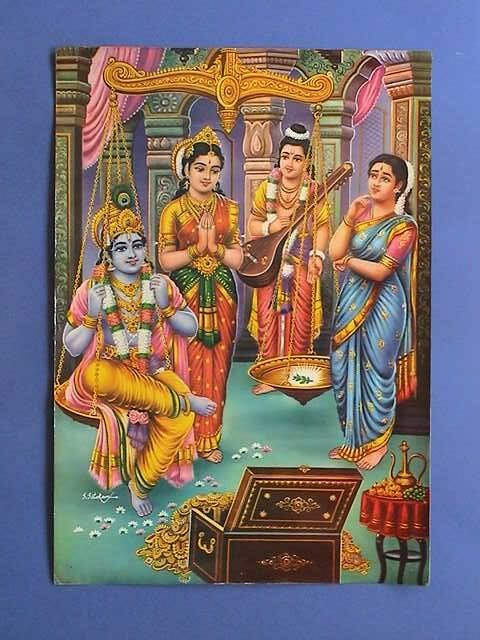 After donating Krishna to Narada, Satyabhama arranged for a big scale to be put up and sends with all assurance for her huge treasure of gold and jewellery. All that she has is soon put on the scale, but it didn’t budge. Narada started taunting her and threatening her that if she can’t put enough gold or diamonds, he will be forced to auction Krishna as a slave to someone else. Satyabhama, in frantic panic, swallowed her pride and begged all the other wives to give their jewels. They agreed out of love for Krishna but alas, it is of no use. Krishna remained a mute witness to all this drama and rubbed salt into the open wounds of Satyabhama’s ego that he has now to become a slave to some cowherd and will have to suffer the separation from his dear wife. Narada suggested to Satyabhama that Rukmini may be able to get her out of the predicament. She finally swallowed her pride and appealed to the devoted first wife of Krishna. Rukmini came and with a prayer to her husband put a single leaf of the sacred Tulasi on the scale (tula). Lo and behold, the scales became all at once so heavy that even after removing all the jewels, the scales were weighed down on the side of the Tulasi leaf. While there are different versions in different texts as to why the weighing was arranged, the story of the Tulsi leaf placed by Rukmini being worth more in weight than that of Satyabhama's wealth is a common ending. This story is often repeated to enunciate the significance of Tulsi and how a humble offering to God is greater than any material wealth.